Vietnam was a country that had been on my bucket list forever so when I decided to add in as part of my backpacking South East Asia Itinerary I couldn’t be more excited. I knew very little about the country or the culture when I turned up in Hanoi as part of my first solo backpacking trip. Perhaps this was a little naive but I was just so damn excited to get out there and explore I didn’t really leave time for planning. As a solo female backpacker I found Vietnam to be a safe, sociable and relatively easy country to travel in and the food was out of this world good. My biggest concern was the traffic- Hanoi and Ho Chi Minh are an absolute nightmare to even cross the road! If you’ve got the time then I’d say don’t overly plan an itinerary for Vietnam as its much better to take each day as it comes. ( A typhoon in Central Vietnam totally changed my plans forcing me to fly from Hue to Ho Chi Minh City then back up later on). 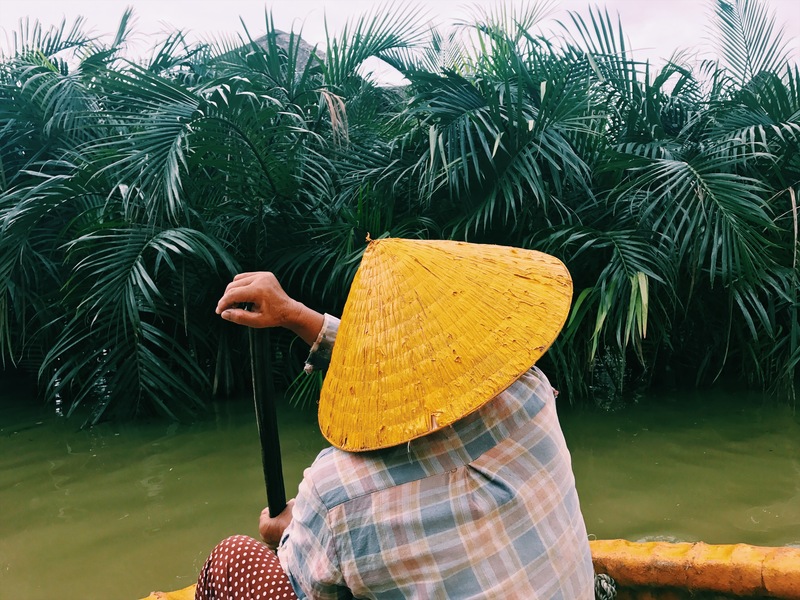 Either way if you are planning on travelling to Vietnam here are a few things to bear in mind first. Ok so first of all if you are visiting longer than 15 days then you need a visa. You need to pre-book your visa before you’ve arrived. There’s a lot of conflicting information online about what you need and how much you need to pay. Basically the thing you’re after is an approval letter. If you book an e visa, it’s the same, just a letter. I went with http://www.evisa.com.vn which is recommended by Lonely Planet. They are legitimate and can process and email you your letter in 1-2 working days for 20 USD or 30 USD if you need it urgently, which is what I did the last-minute. You can apply from home or in another country if you’re somewhere else before. I applied while in Thailand. To apply you just need to send a photo of your passport and a photo of a passport size photo of yourself. If you’re backpacking in Asia you should always have passport photos on you. If time is short and you’re only staying 15 days and you’re from one of the eligible countries like the UK, you do not need to get an e-visa. However YOU NEED PROOF OF ONWARD TRAVEL. A lot of backpackers heading to another country after will not have a flight booked out of Vietnam. You will not be able to get on your flight without this. They will make you book one at the airport and this can be expensive. Now we’re over the visa hassle, the rest is a lot more straightforward. Choosing where to stay: hostels or hotels? I’m not a fan of the whole, arrive in a place, have no idea where you’re staying and walk around for hours with your backpack trying to find somewhere. It is A: Either going to be very hot or B-Going to be raining, so save yourself hassle and prebook the night before. Always book just one night at first, incase the place is awful. It’s also often cheaper to extend a night in person rather than booking it all at once online. In Asia but specifically Vietnam, you get a lot for your money accommodation wise. If you’re up for hostels, you’re looking at no more than £6 a night. I always book mine on Booking.com and now get special discounts because of it. Always filter by distance from city centre, ( You want to be in the city centre. 4.7 k outside anywhere is annoying), best reviewed, lowest price and free breakfast. With the amount of value hostels competing, there is no need to ever pay for breakfast, saving you money. Vietnam is a massive country. Loads of people go on epic motorbiking adventures and they will tell you there is no point going to Vietnam unless you have one. There is. The easiest way to get around in Vietnam are sleeper buses. These two-story buses pretty much have routes across the whole country and are much cheaper than the train. They have vertical beds in them and you can actually sleep, so long journeys are actually quite bearable. Do not book these online. The prices will be in US dollars and that is expensive. You can book in person but it’s best to do it via your hostel or a travel agent. They do add a small commission fee but it is usually worth saving the hassle of negotiating with a Vietnamese ticket seller. Pre book your bus at least a day in advance. For any journeys over 10 hours, I would advise you fly if possible. If you are near a main airport then this is cheap. For example Hanoi or Ho Chi Minh. Danang (Hoi An) to Ho Chi Minh is a good example. It’s a 17 hour sleeper bus or a one hour flight costing just £20. You can book via a travel agent but it’s usually easier and just as cheap on Skyscanner. The money situation is very confusion. Inflation in Vietnam is ridiculous. £1 GBP is 30,000 dong so 300,000 = 10 GBP and 3000,000 is around 100 GBP. This is always good as a base to work from. Download the free XE currency converter app. It works without wi-fi and will be a lifesaver while you get to grips with the currency. Always double-check your change, it’s common to be shortchanged and organise your money in chronological order in your purse. There are no coins in Vietnam so your purse can get pretty full. You can get Vietnamese dong outside of the country but the exchange rate is much better if you change your money once you get there. US dollars are always good to bring as these are widely changed. There are caps on how much you can withdraw so don’t freak out if the first ATM won’t let you. Some banks, generally bigger ones, let you draw out 5 million, others only 2. There is always a high fee for withdrawing. This is unfortunately unavoidable. Vietnamese food is unsung hero of Asian cuisine. Everything in Vietnam tastes amazing and it should never have to cost you more than 100 thousand dong (£3.30). As per usual, eat from street vendors for cheap food, restaurants for a little more. Try the regional specialties in each area. Northern, Central and Southern food varies a lot. Try Bun Cha up North, White Rose dumplings in the middle and Ban Mi in the South. The thing that surprised me most in Vietnam is their coffee culture. You can spend 50 thousand dong on a coffee in fancy places but generally the best places are little cafes on street corners without menus that the locals frequent. Here you can usually get an iced milk coffee, served with free green tea for 15 thousand dong. Alcoholic drinks are cheaper than at home but not cheap in comparison to Vietnamese prices. Beer will only set you back 30 thousand, (1 GBP), but apart from that, the less alcohol you drink, the less you spend. In most cities, the authorities crack down on nightlife after midnight so most bars shut or go ‘underground’ anyway. Reblogged this on PASSPORT PLEASE.